On removing the bird feeder from the post this morning to refill it, I came across a menage a quatre of Earwigs looking very shifty. 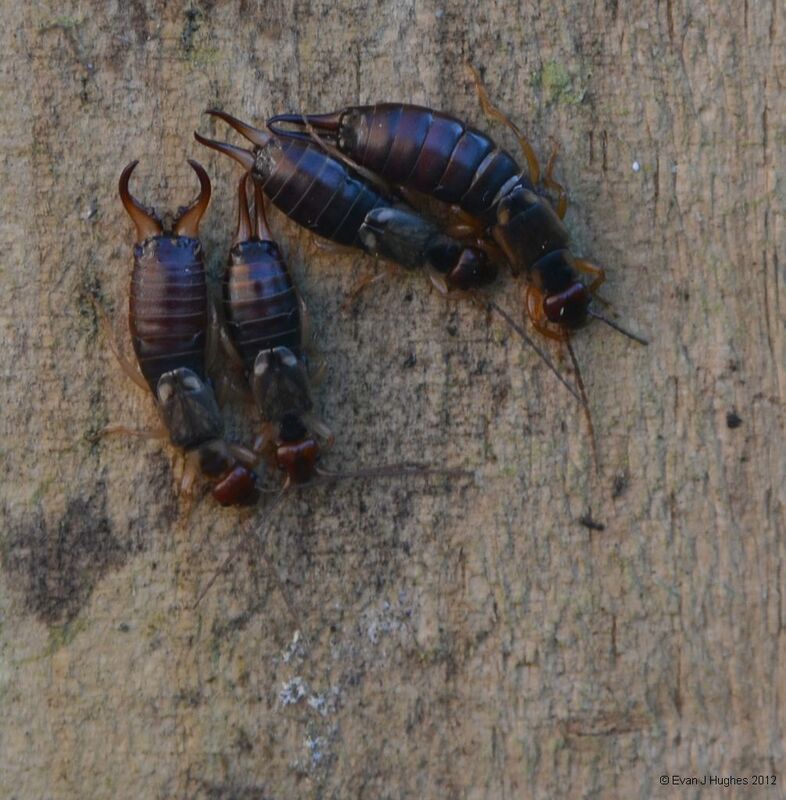 Apparently the males have the most curved pincers, and the females almost straight ones, leading to the very tired looking earwig on the left being a male. 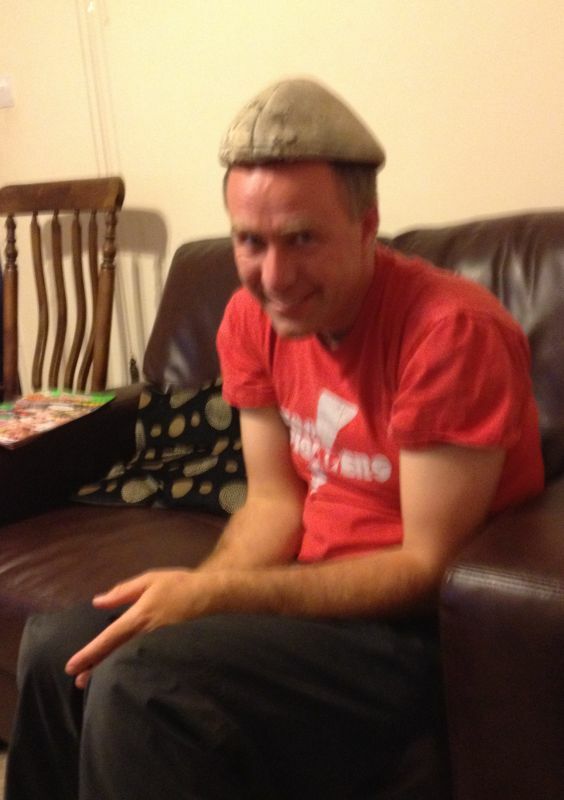 Normally the thought of only tassels can be rather exciting. 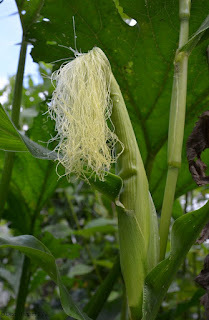 When it is the sweetcorn that only has tassels and no cob in amongst the leaves; it's less fun. I remember as a child opening up the wrappings of a sweetcorn cob at my Nan's market garden; only to find it full of earwigs. If these wrappings do provide homes for earwigs instead of nice juicy corn, at least the chickens will have fun with them. I stopped off this evening at Hackpen Hill as a large crop circle has appeared in one of the fields at the foot of the escarpment. Unfortunately the aliens/local youth (same thing really) who constructed it, did not consider that they needed to be further back in the field; you cannot see the crop circle from the car park at the top of the hill! Well its nose looked a little snout like and it very nearly had a curly tail when I first saw the cloud; by the time I had grabbed my camera its nose was transitioning from piggy with a snout, through to mouse nose and heading towards elephants trunk. Its curly tail started to dissipate too. 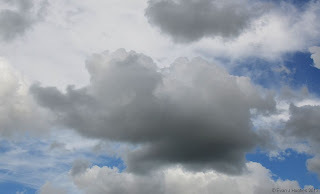 I am sure seeing animals in clouds is akin to reading tea leaves; yet another sign either that insanity is getting a good grip, or that the kids have had long enough on holiday now and need to go back to school! 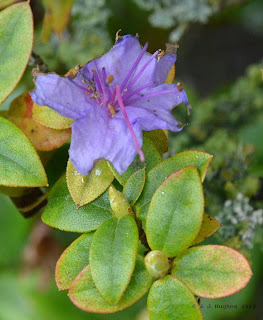 I noticed this morning that our Spring flowering Azalea is starting to flower again; I wonder if it thinks it has had Autumn and Winter and back to Spring, rather than just 'Summer'. I have not noticed any bees trying to visit the bush yet, but at least it would put a little 'Spring' in their honey! We had a fantastic thunderstorm today. 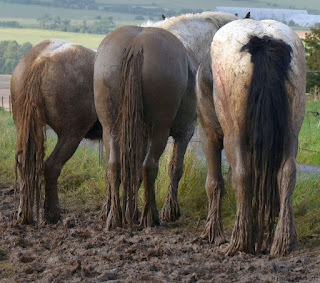 As a consequence, it threw it down, then the sun came out, then it threw it down etc. One of the Lilies got a battering in the rain and lost most of its pollen, creating a yellow stain on the flower petals. The very first of the blackberries was just about ripe today. The trade-off for the bramble being thornless and the fruits being large is that if they are not completely ripe, they are very sharp indeed. This one was borderline with a hint of sweetness; I just could not wait! 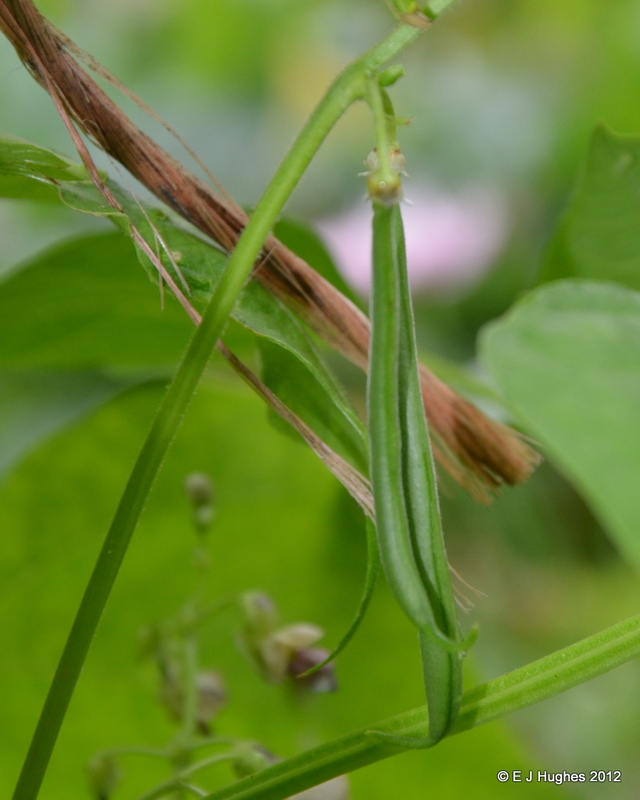 There are lots of red and green ones on the plant too; fingers crossed they will have ripened before Christmas. The vegetable plot has grown rather since we have been in France; mainly weeds, but some veg has at last matured. 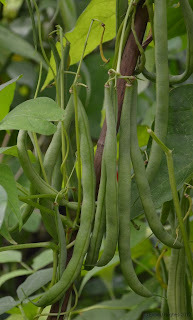 I had hoped that the French beans would have been ready before we left, but thankfully, with the cold wet UK summer, they are now just about right. It took 3 weeks for the beans to mature in the end! We had lunch at Cap Blanc Nez today, overlooking Calais. The weather was very blowy and a bit hazy so you could only just see the cliffs of Dover. The Cap has a memorial on top and is covered in WWII bunkers; the surrounding landscape is also still pock-marked with craters from the Allied shelling of the positions. We ended the day by catching the train through he tunnel back to Blighty; the train is quite narrow when you drive on, causing some poor folks to find an new use for zinc oxide plaster bandage. We sauntered across to Ypres in Belgium today and then headed down to Lille for some shopping. The Menin gate was quite something, commemerating the fallen of the first world war. It looks like Jo's relative is not on the gate itself though; the Ypres are is nice so we will have to plan another visit when we have identified where his memorial is. Lille was impressive too; the selection of shops was good but having almost run out of Euros, we came back empty handed. The day was spent driving back up to Calais; our stay in the Vendée is over for another year. The weather was good, but it feels distinctly colder being up north again. We paid a second visit to the beach again today. We started with a picnic (in a nice wooded area amongst pine cones and loo roll) and then progressed to the sand. The tide was well out to start with, but slowly advanced compressing all into just a few tens of metres of sand. The towels and clothes had to be moved a number of times as Poseidon tried his best to entrap unwary sun bathers (Jon and Liz). 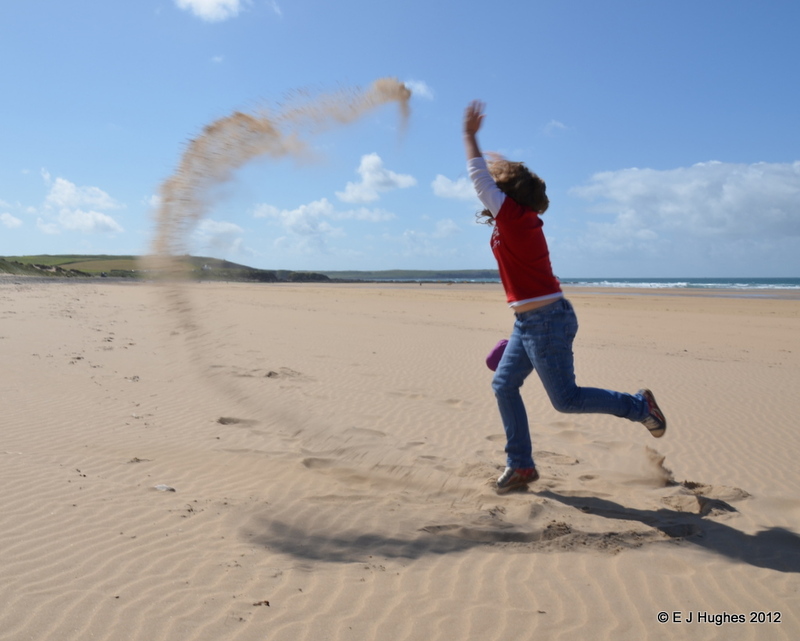 More sand is now rubbed well into unfortunate places, but much fun was had by all. Whilst driving down the road, I noticed a field with an interesting crop. 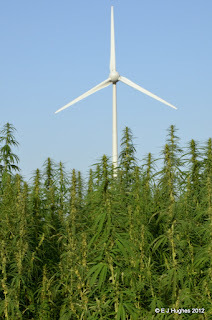 I have never seen an entire field of hemp before and it was quite a sight. I am guessing it is a variety with very low narcotic effect and mainly for its fibre; I thought a picture with a wind turbine was in keeping with the alternative energy/ green theme. 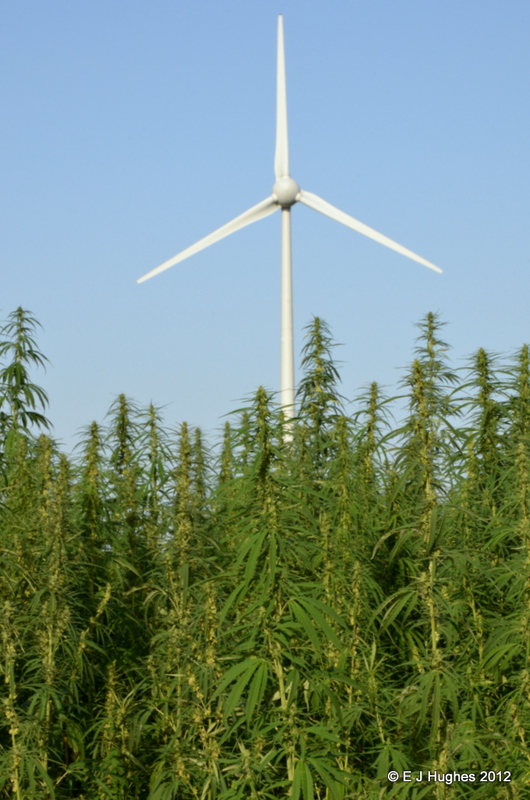 If the hemp is not a low-yield variety though, the field will produce a stash of dope big enough to keep then entire Vendée population happy for the next year! 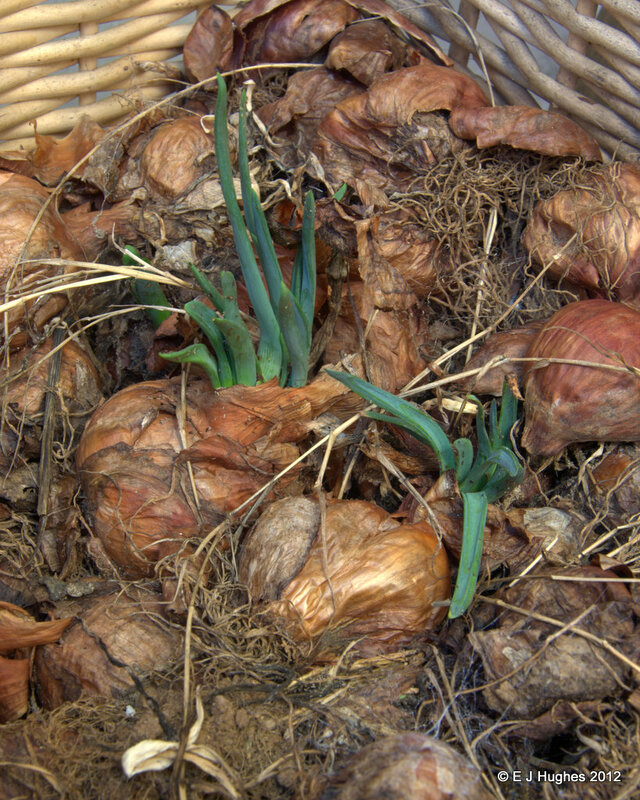 I could not go to France without taking a picture of the stereotype onions or garlic. 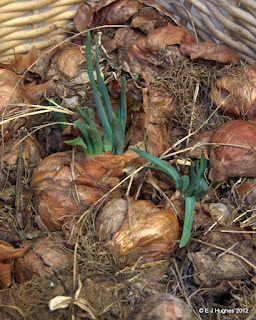 These onions were last years cast-offs but seem to be trying to make a break for it. I think they are past cooking quality. It may not be a good idea to toss them to the chickens either; I am not sure how smells transfer, but oniony eggs may not be to nice! I shall leave them to it. A favorite food of the Vendéen Panda are these day-glow slugs. Unfortunately the slugs are toxic to the Pandas; when you find a half-eaten slug you know Pandas are about as they spit the slugs out pretty sharpish. The slugs can travel at amazing speeds; up to 250 miles per hour at just a foot off the ground. It does mean the Pandas have to be nimble if they are to catch a slug. This morning was warm, but wet. Luckily, the wet weather kept many of the crowds off the beach. In true brit style, we headed out to the surf at Les Conches. The sun came out and this afternoon was glorious. I think the kids will have 40-grit sleeping bags by the morning with the amount of sand they are dropping. Today we walked deep in the forest. We did not see a Vendéen Panda although we looked very hard. We did see evidence of folks trying to keep Panda's off their property however. As Alex is getting better on a bike, street racing ensued this morning. It was not quite the Monaco Grand Prix, but there were thrills and spills all the same. The afternoon saw us setting up tent in the Mervent Forest; a rather excellent spot with lots of places to dunk kids and animals if necessary. I happened across an old landing stage that looked vaugly familiar; it has not weathered well since I last saw it in 2007. 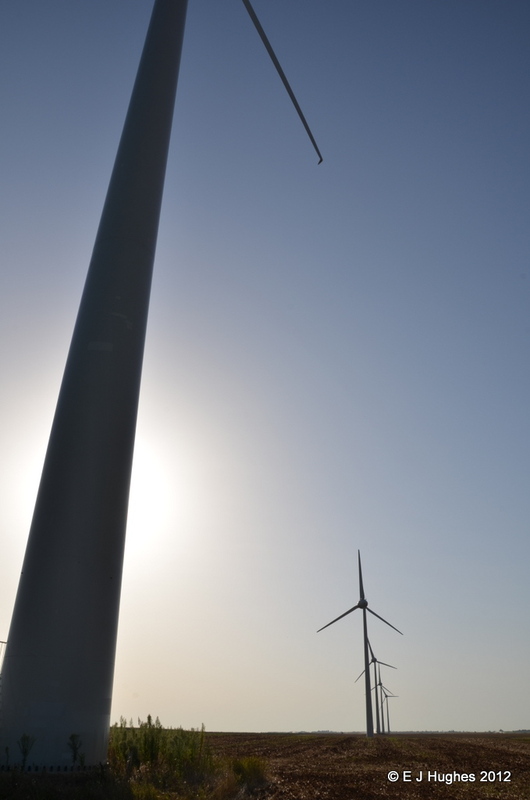 Today we drove down to the Vendée. The weather was hot and the roads were chaos with the French also starting their holidays. French roads are super, until there is a modicum of traffic and then it all stops. The starlings seemed to have the right idea, although they all seemed to be trying to occupy the same lines too. The view of the Château d'Amboise from the campsite is fantastic. We spent the day around the town and Château and also visited the Clos Lucé where Lenny DaVinci spent his last days. Katy and Alex had a great time trying to break the model of da Vinci's helecopter, but did not manage to get airborne at all. The first day of holiday in France saw us camping in the middle of the Loire River at Amboise (there is an island with a camp site on it, we were not floating!). The evening walk into town was fantastic with superb views of the Château and river. Being hot weather by a river, the local insect population also seemed to be out for the night; interestingly none of us were bitten in the night however. 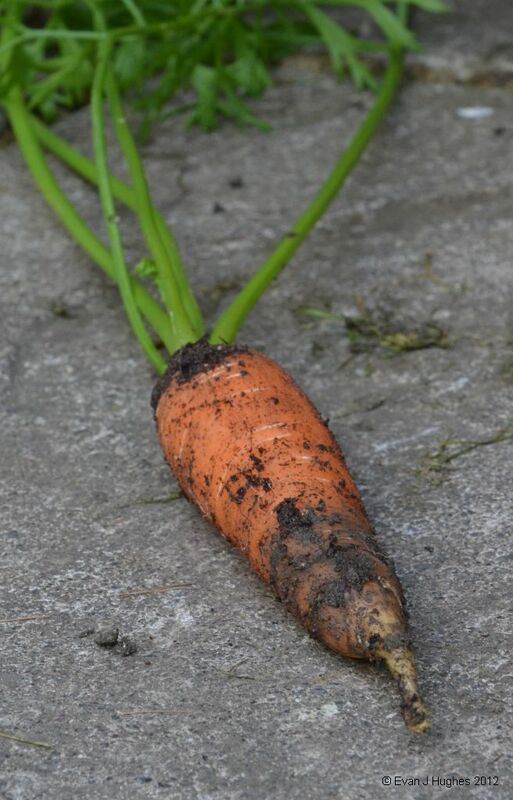 To combat the menace of weeds and Carrot Root Fly, we planted carrot seeds in coke bottles filled with compost. The bottles had their tops and bottoms cut off then they were placed on the ground so that there was about 8+ inches sticking up. I decided to see how they are doing today; the tops look lush, but that is no guide to what is happening underground. Luckily, there is orange gold at the bottom of the foliage! 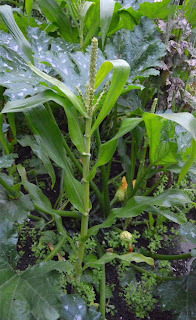 The sweetcorn plants have started to grow the fluffy bits on the top. Shame they are about the same size as the courgette! The late germination and then cold spring/ early summer did the plants no favours. 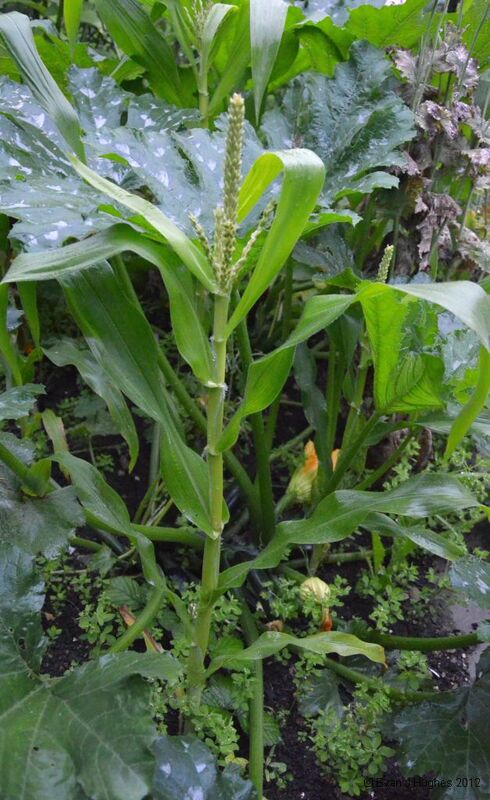 There are a few small bumps lower down the plants that appear to be a token effort at making some cobs, however I think the sweetcorn this year may have to come from Sainsburys. 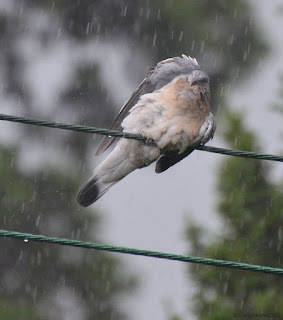 Normally the Pigeons just sit on the power lines looking miserable when it is raining. 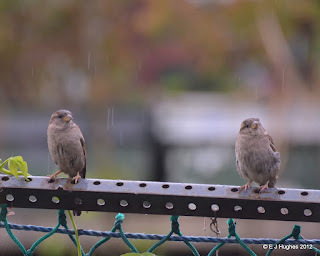 This afternoon, it heaved it down and the pigeons all took the opportunity to wash their pits. It was an interesting sight watching them trying to balance while lifting each wing in turn. It makes a change to them trying to wash in the pond. 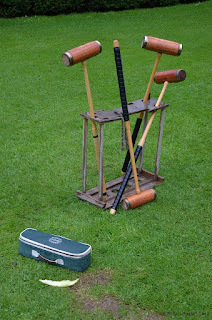 We had a trip out to Hidcote Gardens today; the weather was great but the thunder and rain started just as we stepped out of the car. 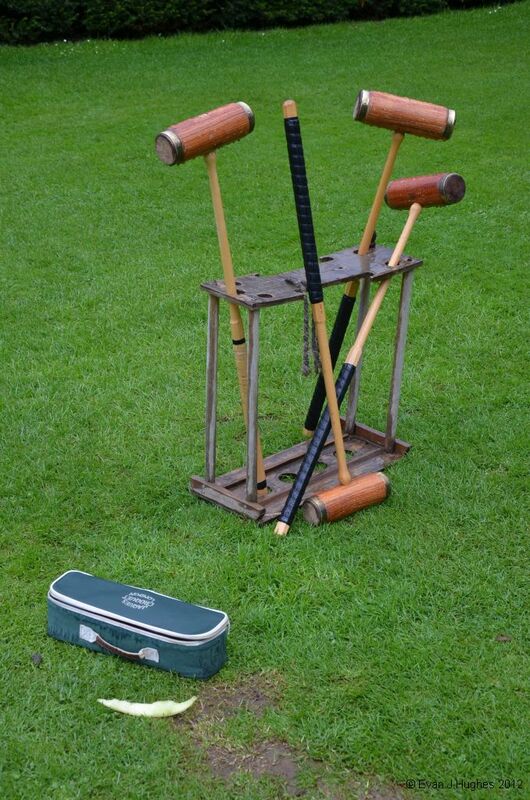 It could have been worse; after trolling around looking at the flowers in the rain, we came across an abandoned Croquet match. 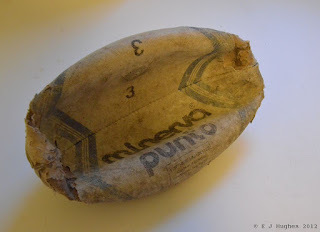 The rain must have started so suddenly that one of the players abandoned their half-eaten slice of Melon. There was not a note by it like you find next to a pint at a bar 'I have licked this' so I suppose it may have been fair game to finish it off; I did not fancy the challenge though. 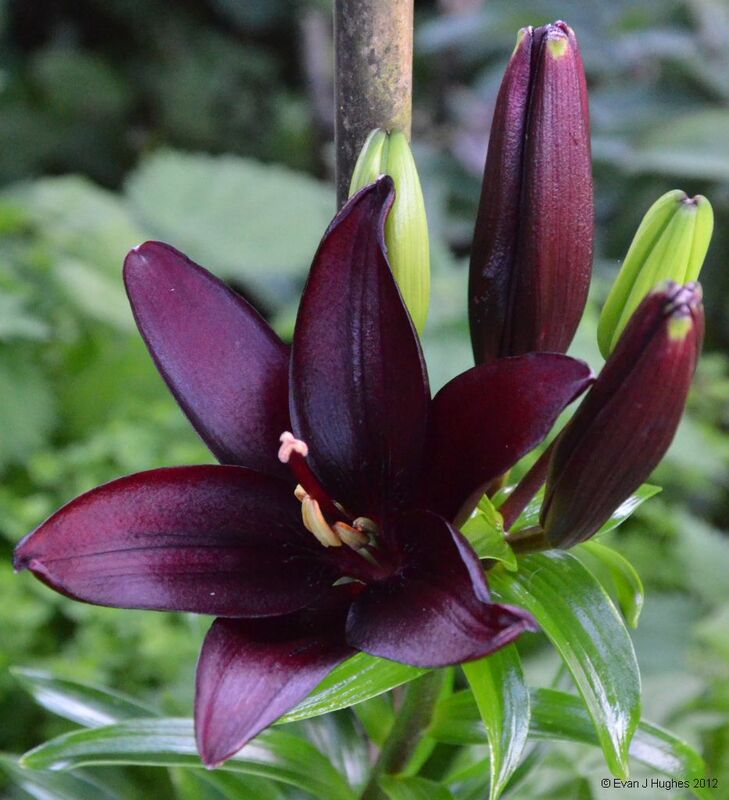 One of the dark lillies was looking splendid today. 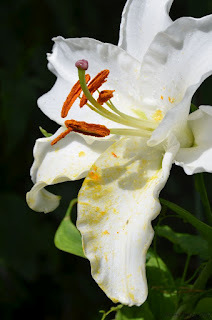 The Lilly flowers have lasted really well this year, despite being pounded by heavy downpours. I also decided that it was probably time to check on the progress of the Anthotype of the Peony. The little sunlight we have had over the last 2 months and 6 days has worked its magic and caused the exposed pigment to fade. The areas of the image that were covered up by the dark parts of the positive image have retained a decent colour. The light areas have faded really well, giving a very useful contrast. If I could be sure of more sun, I may try another image too! 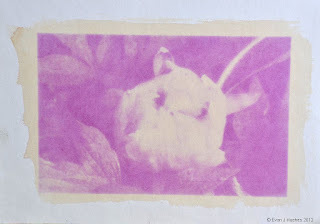 Anthotype of Peony made from Peony Juice. Alex has a new bike today; at last he has learned to ride. Stopping and steering are another matter however. I thought the gears would fit the Olympic theme too as more medals have been won in the Velodrome today; those bikes though have only one gear. 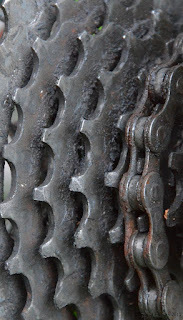 I bet their chains don't have a proper coating of rust either. As 2012 is Olympic year for the UK and we are nearly half way through the main event, I thought a topical image was in order. 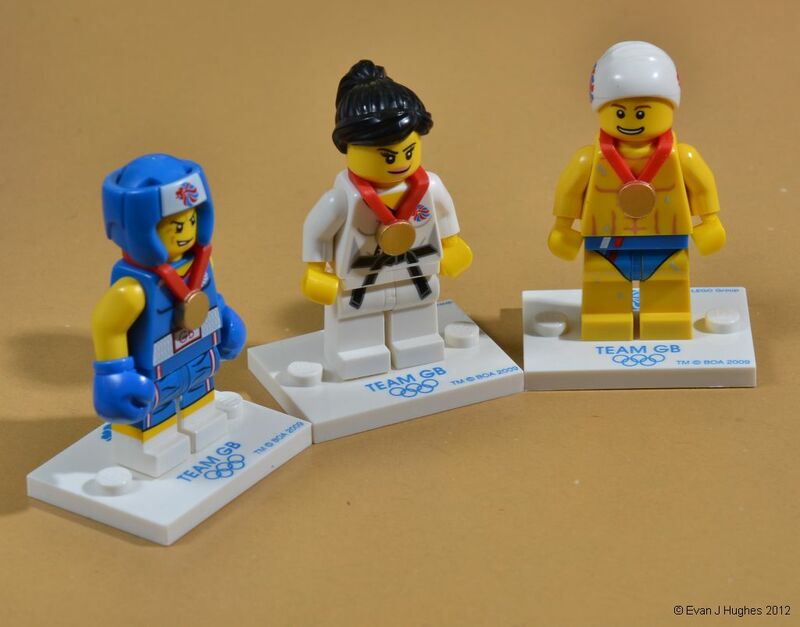 Katy and Jo bought some Olympic Lego figures back for Alex from the Sabre event in London yesterday; an ideal opertunity for a podium photograph. It was luck of the draw as to what events were represented; I know we have won medals in Judo and Swimming, the Boxing finals are next week but there are strong hopes. At long last the veg plot is showing promise. We have had a decent sized courgette and the beans have set flowers and started growing pods! The weather was not so good again this morning; the birds were looking decidedly depressed at the thought of summer being over already. We had a day out at Folly Farm today. The kids had a good time on the climbing frames, teasing the animals and then scaring their parents witless on fairground rides that were built before the advent of health and safety. 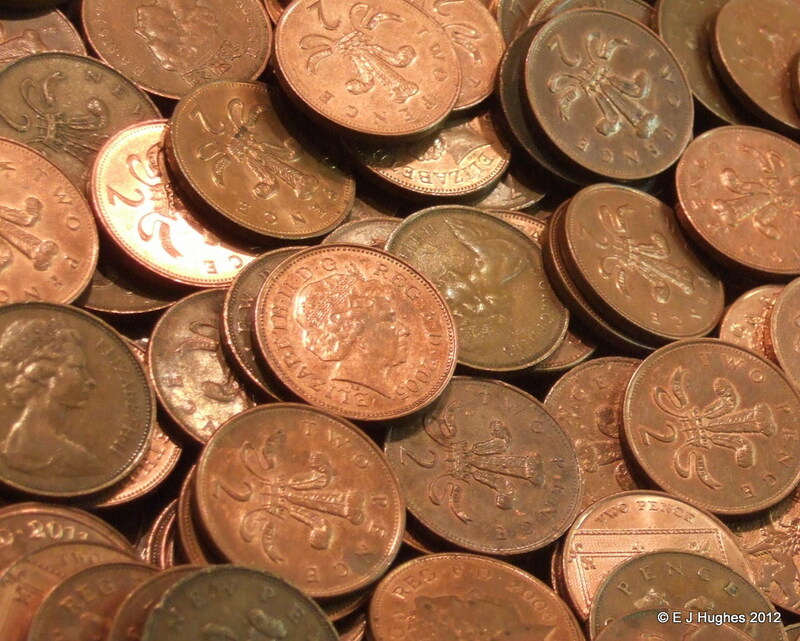 In true fairground style, they hit the slot machines at the end of the day and lost all their remaining cash. I could not decide on any one single picture from today; there were lots. 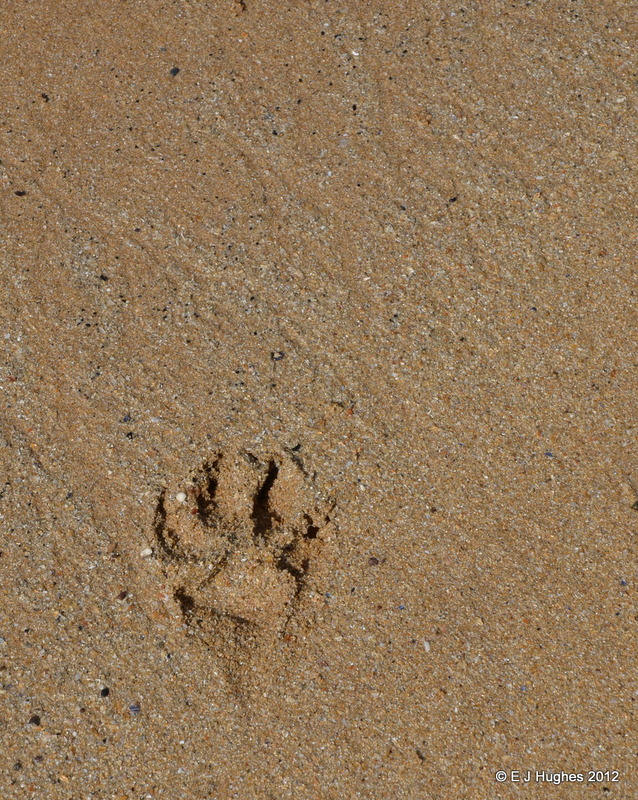 In the end, I decided on a set of pictures, with a tenuous thread of beaches running through them. 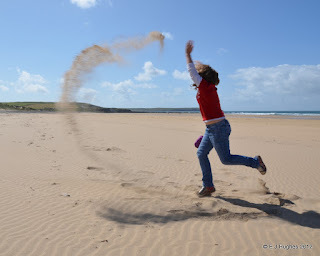 The first picture is of Katy throwing sand in the wind on Freshwater West beach (just by where Shell Cottage of Harry Potter fame was filmed). I made the mistake of standing downwind at first; thankfully the camera has quite good seals on it to keep the sand out! 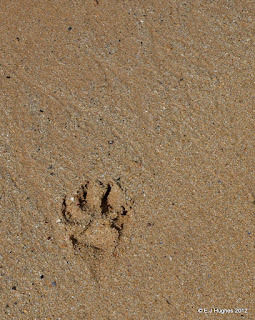 The second picture is of a footprint from some mythical beast (well, probably a dog) on the beach; leading into the tenuous link to the last two pictures. 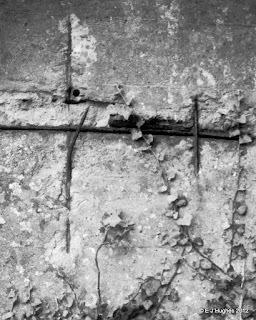 The picture of the reinforcing bar and ivy is the remnants of an old blast wall at the top of the beach made of concrete (which is made of sand...); the final image is some rather good graffiti on the other side of the blast wall of some mythical beast that stalks the beaches at night. 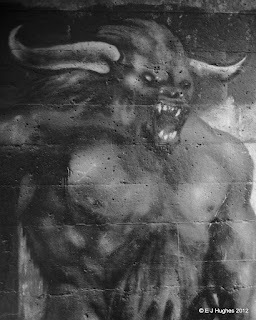 There are some really good graffiti artists around, however some local muppet had sprayed a crude bright-red knob over the decent painting; at least taking the photograph on a paper negative reduced the contrast of the vandalisation. paper negative through a yellow filter.